This article originally appeared as a post on SNBForums. The author agreed to have it published on SmallNetBuilder and has been compensated. I’ve recently moved to a new location and the builder was nice to enough to place a CAT5 outlet in every room wired to a central location in the electrical room, which greatly helps with future network expansions. Unfortunately there was no CAT5 outlet in the living room, which is where my HTPC, IPTV box (cut the cord many years ago) and Xiaomi TV box reside. The only option was to use wireless, powerline networking or MoCA. My HTPC is used to play uncompressed videos and the viewing of my large (1.2TB) collection of family and travel photos from my FreeNAS server. Fast network performance is essential for a smooth user experience, especially because my other two devices (IPTV box and Xiaomi TV box) are also very bandwidth intensive. When I first moved into the new house late last year, MoCA 2.0 adapters were not widely available because they are undergoing final certifications. So I had to first settle for wireless with very unsatisfactory results. My HTPC, IPTV box and Xiaomi TV box support 802.11n and 802.11ac. But many WIFI devices operating in close proximity and streaming large uncompressed files proved to be a very painful and sluggish experience. My Wi-Fi network at home is very robust, including two Meraki MR18 access points in mesh mode. But they are still not suited for latency sensitive and bandwidth intensive applications like HD media playback/streaming. Powerline networking is completely out of the question because there are no available sockets in the electrical room. Even with an available outlet, there is no way to estimate the performance since they are on a different floor and there are too many unknown variables at play. Running additional Ethernet cables is also unfeasible because my basement is finished and it will cost thousands of dollars to break open the walls and fish additional cables. With a coax outlet nearby, MoCA networking is the best alternative to achieve a wired near-Ethernet experience. 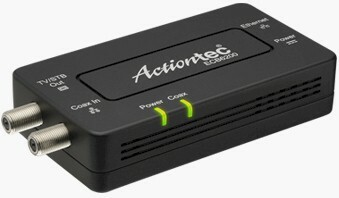 I first had to settle for Actiontec’s MoCA 1.1 adapters (ECB2500C) that delivered the full advertised speed of 100 Mbps while I eagerly awaited the release of MoCA 2.0 adapters. After a few months of waiting, they finally became available last week through B&H and I immediately ordered a pair of ECB6200 with free shipping to Canada. ...and even include a pair of high quality soax cables. The adapters themselves are very well built and is encased in a matte plastic shell (thank goodness it’s not glossy). The Ethernet and coax port feels sturdy and exhibit zero flex when attaching cables. There are two LEDs on the front showing power and Coax connectivity. Here's the serial number label. There is thread in the Forums where helpful member pinotphile has posted a firmware update (ecb_flashimage_2_11_1_10_6200_1.bin) for the ECB6200 that addresses several performance issues. After applying the update and installing the ECB6200, I performed several benchmark tests to measure the performance improvement of MoCA 2.0 technology. Note no other signals (cable, satellite, OTA TV) were present on the coax used to connect the MoCA adapters and no splitters were between the two, either. Below are the system specs for the HTPC and my FreeNAS Server. Both systems can fully saturate a Gigabit Ethernet link. I tested throughput two ways. The first set of benchmarks used LAN Speed Test Lite with 1500 MB file size. According to the official publisher of LAN Speed Test (Lite), this tool builds a file in memory, then transfers it both ways to a target network shared drive (without effects of windows file caching) while keeping track of the time. Ir then calculates the read and write throughput. The second method used Windows drag-and-drop filecopy of a 4 GB media file. Both tests were run in two directions, measuring write and read throughput. As a point of reference, I previously measured my old Actiontec ECB2500C MoCA 1.1 adapters at ~100 Mbps throughput for both write and read. My initial tests came up with the following results, with the LAN Speed Test and Windows drag-and-drop methods producing similar results. But after 1 week with the adapters powered on 24/7 and 20+ hours of use, the send (TX) speed throttled down to around 170 Mbps to 200 Mbps while the (RX) speed remained unchanged. In the meantime, I’ve watched about 20+ hours of videos on the HTPC and experienced no lag, stutter or connection drops, even with the lower transmit throughput. This seems like a good indicator of adapter and network reliability. To me, MoCA 2.0 is as close as you can get to Gigabit Ethernet performance without the need to run Ethernet cable. Since many homes are pre-wired with coax cables, I feel MoCA 2.0 is the most reliable solution to provide stable and consistent networking performance throughout a home compared to powerline or Wi-Fi. As one of the first generation of MoCA 2.0 adapters in the market, I hope Actiontec can provide active support with future firmware and performance enhancements that will further improve the overall user experience.